We have not forgotten Polshek Partners, and then, Executive Director Andrew D. Hamingson, for insisting that a marquis, extra lighting, an enormous three-sided stairway, permanent billboards placed mid-sidewalk and an 18′ extension of the sidewalk into the Lafayette St. roadbed would be good for us…nor CB#2’s insistance that this was the ONLY way to also provide handicapped ramps with a $4 million capital infusion from City coffers…not to mention the diminusion of the other three very large individually landmarked buildings or the entire NoHo Landmarked District along Lafayette St., but, that’s the way of politics. We do still love The Public Theater and wish the new interim Executive Director, Joey Parnes, long tenure (his creds as an Executive Producer are pretty impressive). We would have gladly allocated the City funds to cultivation of talented playwrights…and a decent ramp. But, now the plaza construction is underway. The Public Theater-CB 2 presentation was respectfully and sympathetically delivered to interested neighbors by stalwart Director of Capital Projects and Government Relations, Adrienne Dobsovits, at a hearing held last month in the clock tower at the Cooper Union. Construction in the roadbed will start at 411 Lafayette. The bike lane will be shared with parking/deliveries on the west side of Lafayette, marked with special signs. Jersey barriers will move traffic on the east side into the middle lane. Roadbed construction will continue till the “Summer Streets” event in August, when Lafayette is closed to all traffic but bicycles (and the occassionally brave pedestrian) on Saturdays. From August thru October the steps will be constructed. The whole project is expected to be completed by March 2012. Questions can be directed to: adobsovits at publictheater.org. 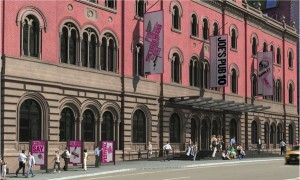 BTW: We are trying to ignore the extra prominent banner for Joe’s Pub 10 – obviously a commercial, non-theater advertisement. We certainly hope that doesn’t also get a billboard in the middle of the sidewalk. We can just see it now…the Indochine Billboard, the Butter Billboard, the Dominion Billboard, the Colors Billboard, The Crunch Billboard, the Blink Billboard, The Astor Wine & Spirits Billboard, Chinatown Brasserie Billboard ! 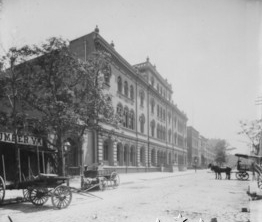 Unless, of course the Landmarks Preservation Commission can come up with some more double-speak that will disallow all the other landmarked buildings what they should never have allowed the Public Theater/Astor Library, in the first place. Stay tuned. Free tickets for this year’s Shakespeare in the Park series will not be available at the Public Theater this year. 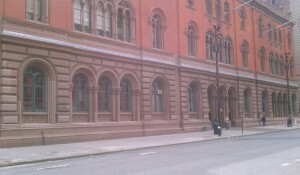 You will have to line-up at the Delacourt Theater in Central Park or at designated locations in other boroughs. Click here for instructions.